Week ending 25th January 2019. 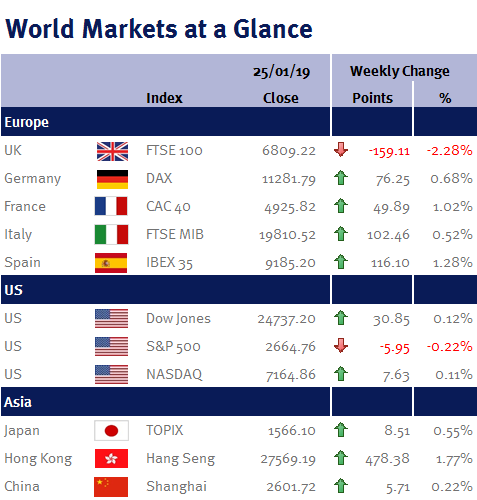 Most global equity markets took a breather after recent gains and ended the week virtually unchanged. Monday’s (21 January 2019) Chinese Q4 GDP slowed to a 6.4% annualised growth rate, down from 6.5% in Q3. As a result, 2018 full year growth came in at 6.6%. Given this was the weakest growth since 2009, there was plenty of media hype around a China “slowdown”. However, the data reading wasn’t terrible – and I believe China’s rate of growth is likely to continue slowing as it’s impossible to maintain such a breathtaking rate into perpetuity. As such, slowing Chinese growth should be seen as the new norm. As for the goings-on at the annual World Economic Forum in Davos, I found very little of interest given that Donald Trump, Theresa May, and Emmanuel Macron (the French President) were all absent as they are all fire-fighting at home. On that, in the US this evening (Friday 25 January 2019), Donald Trump finally agreed to a deal to end the 35-day government shutdown – albeit only temporarily as the deal only funds the government for the next three weeks. And in the UK, the pound strengthened on speculation that Brexit will get delayed. But what is good for the pound is bad for the FTSE-100, as it lowers returns for exporters and the value of overseas earnings – hence why the FTSE-100 ended the week 2.28% lower. However, while extending Article 50 is one way of preventing a chaotic no-deal Brexit on 29 March, it doesn’t resolve the standoff in Parliament or with the EU. Additionally, I also believe pushing out the departure date could simply prolong the uncertainty that has already hit business investment and consumer confidence. Elsewhere, as expected, the ECB left interest rates unchanged on Thursday (24 January 2019). However, Mario Draghi, the ECB president acknowledged risks are now pointing downward – although he also stated that the risk of recession is low given monetary policy is still accommodative, employment strong and energy prices low. Next week all eyes will be on the US: we should get a better view of the Fed’s changing stance on US interest rates when Jay Powell, the Fed Chairman speaks after the Fed’s monetary policy meeting; while the Chinese Vice Premier travels to Washington for trade talks. Additionally, we have US PCE (the Fed’s favoured inflation measure) and US employment data (non-farm payrolls; unemployment rate; the participation rate; and average earnings). Elsewhere, we have Eurozone Q4 GDP and the UK Parliament votes on Brexit Plan B!